Take me to the vineyards, and give me wine! Bolivia: dangerous descents and fascinating flats! It’s all about the altitude! chrisandhels on How do they do it? ‘Enjoy your dive. You’re a very strong diver.’ Lisa’s words lingered in my mind as I headed into the deep. From the surface, you could only see the first 20 metres of line, beyond that, it melted away into the blue, as I soon would too. Relax, equalise, you have the oxygen, don’t be afraid, stay calm… Heading for a new maximum depth is always a bit nerve wracking; I remember it from trying to hit 16 meters months earlier in the Philippines, but this was going to be at least double that depth. Not possible, surely? As I descended, the pressure in my ears increased, but the equalisation wasn’t difficult; I was in control. The thing is, you don’t look where you’re going; you keep your chin tucked in, you keep soft focus on the line in front of you, and just … keep … going. Tempted to grab the rope and turn back I took a little glimpse ahead of me; the bottom weight is right there! You can’t quit now! But then, every second spent going deeper increases the risk. Maybe it’s too much, too far, too deep. Sometimes, the ascent can feel like an eternity. Fifteen metres down and rising fast, Lisa appeared in front of me, looking calm, happy, exuding confidence – I am desperately trying to show that I’m ok but my stomach is contracting heavily as my body gives me the signal that it needs to dump carbon dioxide. Hold on, hold on, just a few more seconds…. ‘Breathe, breathe, strong inhale, breathe.’ These are Lisa’s words; I’m on the surface, I’m ok. I look at her with clear eyes as the oxygen floods back into my system. ‘You made it to the bottom?’ she asks, gently. I nod my head. ‘How deep was it?’ I check the dive computer on my wrist; it reads 34.7 metres. We were in Honduras, it was the end of August. We’d been in Central America for almost an entire month and bar one snorkelling trip in Belize, we’d literally hardly stepped foot in the ocean; we were desperate to get back into diving! And that’s when Helena found Freedive Utila. Utila is the smaller of the three Bay Islands. A mecca for scuba divers, it also has a dedicated freedive school mainly focusing on running the Apnea Total courses. When we arrived, we made a beeline for the school and were greeted by the owner, ‘My name’s Mark but everyone calls me Tex … because I’m from Texas,’ he added by way of explanation. 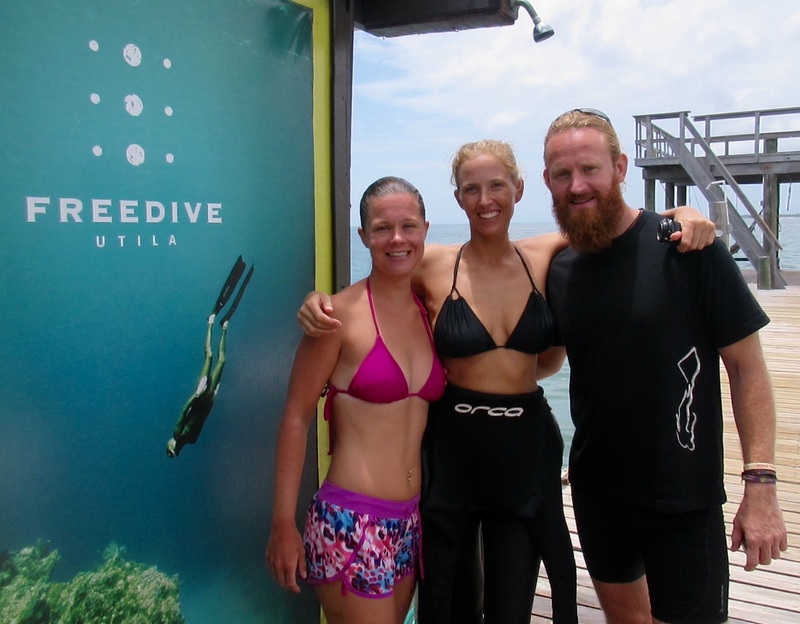 We chatted about our freediving experience so far and Tex invited us out on the boat the following morning to fun dive. Perfect! ‘Fun’ diving, as far as free diving is concerned, is still effectively a training session. Unlike scuba divers who go down for 40 minutes or so and check out all of the fish and coral they can find, free divers get a kick from hanging on to a floating buoy for a few hours, seeing how deep they can go and for how long. Freedive Utila’s fun dives however actually have the added bonus of often being run at a site above a sunken wreck, that of the Halliburton 211, which offers depths up to 30 metres. I was very happy to find that having not dived since the Gili Isles, I was still comfortably capable of hitting around 25 metres. 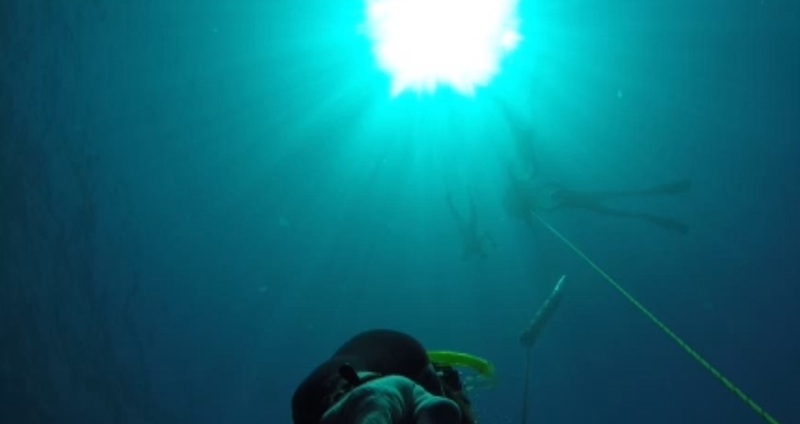 Tex and Helena ascending back to the buoy. The second day was even more fun! 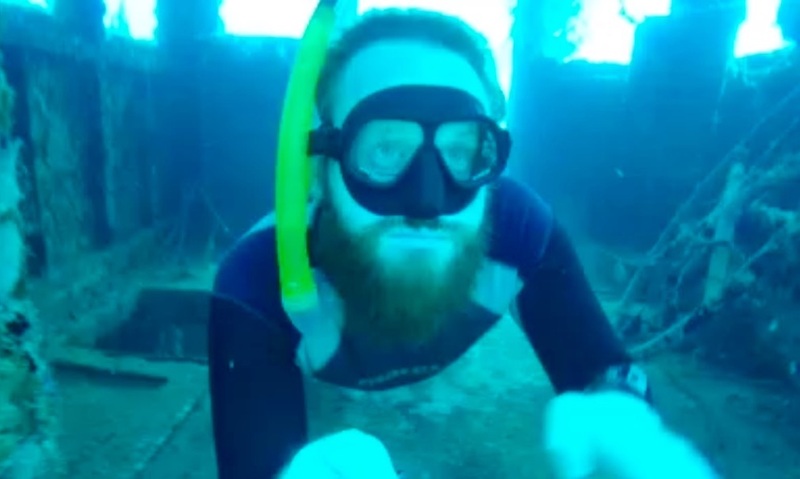 The lines were running slightly deeper; I made a dive to at least 30 metres (which equalled my pb) and then we played around by making videos of swimming through the wheelhouse of the wreck. I have yet to figure out how to upload videos to this blog, but as soon as I find a way, I’ll get it on here! Helena, although still struggling a little with equalisation, was also gaining depth in the feet down position. Exploring the shipwreck wheelhouse at 21 metres down. First of all, we moved into a room at Freedive Utila and were immediately welcomed into the family. It was a great atmosphere in the group, with a huge focus on eating Baleadas (Honduran national dish, look it up!) that was second only to the time spent diving. Just a part of the Freedive Utila family. Then we were introduced to our instructor, Lisa, who is not only an exceptional diver, she is also an inspirational coach. Her gentle and reassuring manner put us at ease from the outset, and her genuine sense of energy and enthusiasm for all things free diving was infectious. Lisa gets a real kick from diving, going into an almost hypnotic trance during her preparation and focusing on all the positive aspects of every dive, no matter what the depth. Day one of the advanced course begins with static apnea training – very simply, the art of holding your breath for as long as possible without moving. This can either be done ‘dry’, (i.e. on land) by putting on a nose clip and keeping your mouth closed, or face down in the water. We were to do both. Helena went first. We had wandered out to the wooden dock and she was lying face up on a yoga mat with Lisa sitting cross legged near her head, speaking gently, counting inhales and exhales as she prepared Hels for her first attempt. The breathing preparation takes at least five minutes and focuses mainly on calming you down, reducing your heart rate, and clearing your mind. ‘When you’re ready, take a big breath,’ said Lisa softly. It was time. Two minutes passed and Helena looked comfortable. Lisa was now looking closely at Hels’ stomach, searching for the tell-tale muscle contractions that signal increased levels of carbon dioxide in the blood stream. 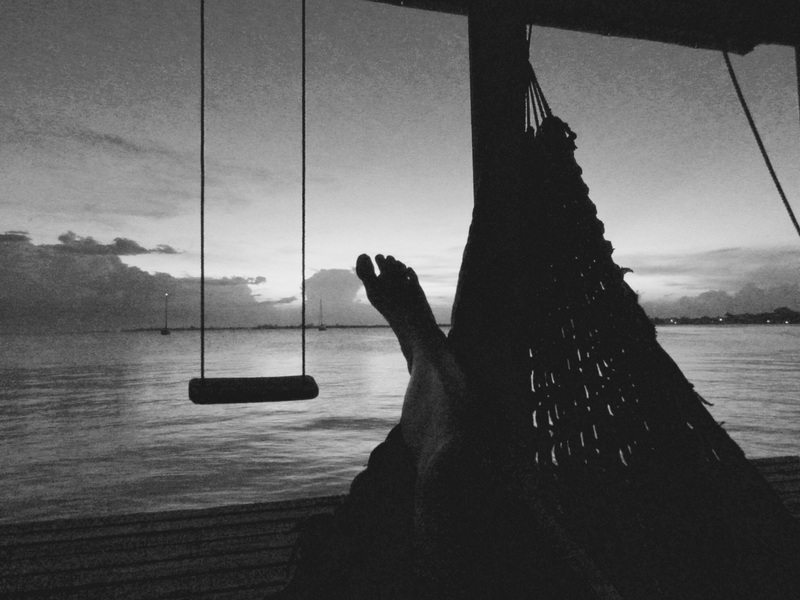 We didn’t take pictures during the course – sorry – but hopefully this shot of Hels chilling on the dock will enhance the story at this point! Then it was my turn. I was feeling a bit nervous – the last time I’d tried static on Gili Trawangan, I hadn’t even managed to hit the same time I’d done on the first day with Wolfgang – 3mins 30secs. I was worried I may be in for another disappointment. I’m not sure whether it’s harder to fight the urge to breathe when you’re at depth or when you’re on the surface. At depth, you pretty much have no choice; if you open your mouth, you’re breathing in water! In static apnea on the surface though, all you have to do is lift your head and it’s right there, sweet, refreshing, oxygen-rich air, ripe for the breathing! In dry static, it’s even worse. You just need to open your mouth. But somehow, I managed to fight the urge. When my contractions started, I heard Lisa’s voice in my ear, coaching me through it, checking I was safe. The thing is, once they start, they just keep coming, getting stronger and stronger all of the time. Soon, the entire front of my torso, from my abdomen right up to my throat, was pumping in and out. ‘That’s good, that’s very good, you’re going to be very happy,’ Lisa’s voice still helping me through, but then she changed tack,’OK and now breathe. Breathe Chris, breathe.’ Breathe? Really? Does she mean it? I had a nanosecond of doubt before I took up the offer and opened my mouth to begin recovery breaths. After discussing my ordeal (because it had pretty much been a fight from the start), and venturing a guess of three minutes, she showed me the watch. It read four minutes and three seconds. I was stunned. We moved into the water. Helena went first again, and after the same preparation, was looking comfortable, lying perfectly still with Lisa watching closely. Then, all of a sudden, she popped up. It had only been two minutes and 45 seconds. ‘Sorry, I just felt like I had to come up,’ she said wiping the water from her eyes. Sometimes it goes that way; like anything, you get good ones and bad ones. So, a bit sooner than anticipated, it was back to me. Nose clip and goggles in place, breathing through a snorkel, I was floating face down to prepare. 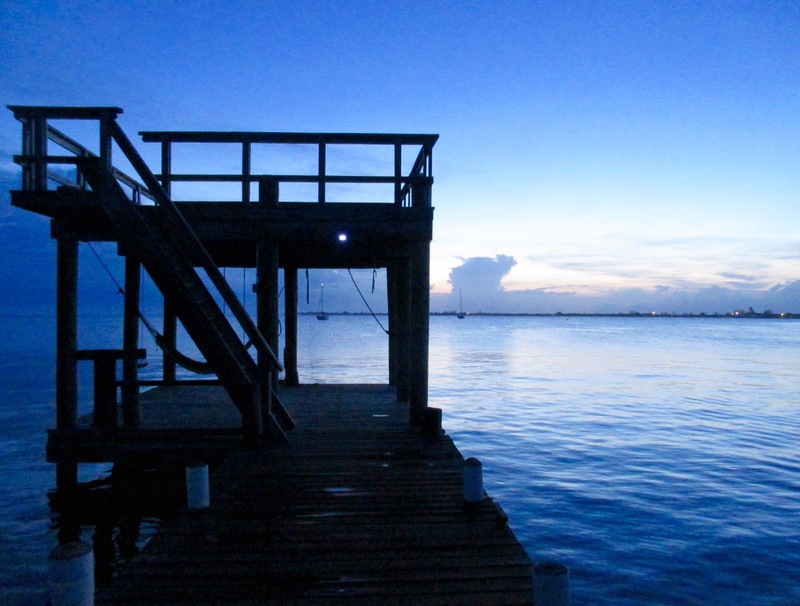 This time I felt much calmer than I had on the dock. After all, I’d just done a 4 minute breath hold, I had nothing to lose. We went through the full preparation, I took my final breath, and put my face down. With your face in the water, things are different. Your senses are numbed from the outer world, especially your hearing. It’s easier to enter your own headspace and remain enclosed within it. Although I went through my initial discomfort, a phase I’m beginning to get used to with breath holding, I suddenly found myself in an extended moment of complete calm. It felt so relaxed, so easy. Spiritual, even? Inevitably, the contractions came, and soon Lisa was talking to me, asking for ok signals, pushing me on but keeping me safe. Eventually, she told me to breathe and when I surfaced, I was amazed to read 4:37 on the watch. Four minutes, thirty seven seconds. I had not only equalled the dry static, I’d surpassed it by over thirty seconds. And I felt like I could have done more. Neither of us would have guessed that we could do this kind of length breath hold! Buoyed by our static performances, we were keen to get back into deep water. Day two was focused on ‘exhale diving’. I won’t go into too much theoretical detail, but there are an unexpected set of bonuses that occur when you let the air out of your lungs before you dive; it’s also the best way to train your lungs to cope with deeper pressures. You’d think that you would need as much air as possible, but the main benefit of exhaling is that it is actually much easier to dive. It makes sense, really: with full lungs, you’re incredibly buoyant, so it’s hard to descend. Diving with empty lungs alleviates the buoyancy issue and incredibly, doesn’t necessarily mean you can’t dive for as deep or as long … But to go into that would to be getting super technical. I do clearly remember one of my early attempts though; I’d followed Lisa’s instructions: taken my last big breath, then relaxed and let it out, before heading down the line. It was certainly different – I was dropping like a stone! Then all of a sudden, I had this desperate urge to breath; it wasn’t a contraction, it was just a very strong deep sensation, sent from somewhere in my nervous system that had me heading for the surface at speed. Hanging on to the buoy, I described what had happened. ‘That sounds like your vagus nerve,’ said Lisa, ‘It’s a survival response triggered by pressure on your abdomen.’ The most important thing was that it could be trained. ‘If you give in to it each time,’ Lisa explained, ‘it will get stronger. You need to relax, thank your body for trying to keep you alive, but have confidence in the fact that you have the air. It will fade.’ And it did. I still get the sensation at depth, but I’m learning how to manage it. Day two then was another huge leap in our understanding of free diving and the way the body manages the effects of pressure and depth. Helena and Lisa on deep diving day. Speaking of depth … Day three was deep dive training. We are now back to where I started this post, with my dive to 35 metres. Helena too, despite still not fully solving her equalising issues, was diving to greater depths feet first, hitting 20 metres on day three. So we came back from our final session satisfied, happy, stunned, grateful and inspired. And now, it was time to go. Well, I thought it was, but Helena was keen to get in another session. ‘You want to go out again?’ I questioned, feeling tired after completing the course but knowing that if the boat went out again the following morning I’d definitely be on it. We spoke to Tex. ‘Well, we don’t have any courses going tomorrow, but if you both want to dive, that’s enough for me to take the boat out. There won’t be any students so we can go to the deep site if you like?’ It took us all of two seconds thought to accept the offer! The dive boat in Utila’s calm water. So, it was the true final day. 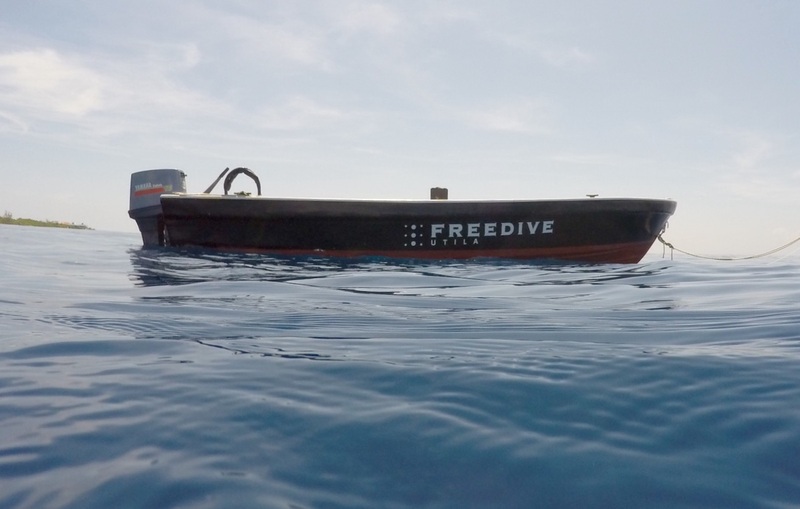 We were anchored in deep water with two dive bouys set up. Both lines were running to well in excess of forty metre depths. Tex was on one, with Jon, the other instructor, and Louis, one of the masters students. On our buoy we had myself, Helena, Lisa and Zach – the other masters student. All experienced divers, all focused on doing our own dives, all acting as safety divers in rotation for each other. Having thought I may have been too tired, I was now feeling pretty good and keen to recreate (and beat) some of the depths from the day before. I was slightly niggled by the 34.7 – I wanted a true 35. The first couple of warm up dives, however, didn’t go particularly well. I couldn’t seem to find proper focus, couldn’t clear my head. I’d made comfortable dives, but it just wasn’t feeling that good. Soon it was time to make a decision – go for a maximum dive, or use this as a practice session. The thing about deep diving is that you can’t do it repeatedly; you can’t push your limits and then expect to do another and another and another dive to the same depth. It takes a lot out of you, so if you want to do it, you have to do it early on in the session and fully commit. On my fourth dive then, I let them know I was going for maximum depth (It’s an important part of the safety protocol to let your safety diver know what dive you’re doing). I went through the full breathe up, got myself calm and focused, took a final breath of full lungs, and headed down the line. Initially, things seemed to be going ok. I’d got past the first ten metres, I was beginning to feel my body getting drawn into the ocean as it became more negatively buoyant, it was going well. The vagus sensation came and went, and then … I turned. Something inside clicked, my hand clasped tight onto the rope, and I sent myself upwards without knowing what depth I had reached. 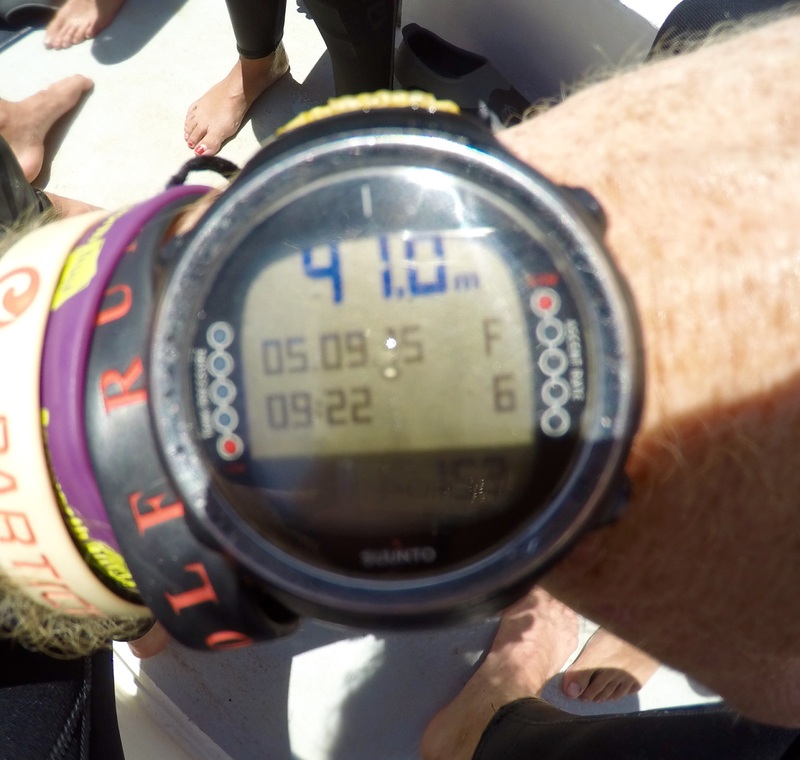 Back on the buoy, I took recovery breaths, signalled to Zach that I was ok, and then looked at the watch – 33.2 metres. I hadn’t even matched the dive from the day before, let alone beaten it. Frustrated, I considered calling it a day there, and for a few minutes I just watched the other divers and performed my safety role in turn. She had a point. You can’t always expect to go deeper every time; there will be better days than others. Zach drifts down easily to the Halliburton wheelhouse. With this thought in my mind, I decided to go for one more dive. This time, my main focus was on enjoying the dive, staying calm, relaxing, being grateful for where I was, for who I was with, for just having the opportunity to learn and perform in this sport. Strangely, the preparation for this dive was perhaps even worse than the one before; there was a slight swell on the ocean and I was beginning to feel nauseous. But, as the water splashed into the snorkel, and then onto my face as I was taking my final breaths, I began to feel a strong desire to be under the surface. I’d never known that sensation before – I guess my subconscious knew it was still down there! My subconscious was right. As soon as I was fully submerged, the nausea instantly disappeared. Heading down the line I felt calmer than I ever had on any previous dive – I think I may even have had my eyes closed. I began to feel the rope trailing faster through my fingers as the ocean welcomed me to its depths, and then … I stopped, and did nothing. We’d spoken about this part of deep dives on the course, the freefall – when your body is no longer buoyant due to the pressure of the water on your lungs and so you simply drop deeper into ocean. You’re weightless, flying. It felt a bit like when the static had become really easy three days earlier. Thank you body. Thank you for being so amazing. Everything was positive, my mind was almost completely empty, the only sensation being the continual trickle of line through the fingers on my right hand, metre after metre. I was going deeper, I had no idea how deep, but I didn’t really mind; something would tell me when it was time to turn – a contraction maybe, possibly even the weights at the end of the line. That something actually turned out to be an inability to equalise any more. I just went to relieve the pressure in my ears and it didn’t work. I tried a second time, still nothing. Oh well, it must be time to go. Grasping the line, I turned and began to ascend. Although it seemed to be taking a long time, I felt comfortable, in control, aware of my body and its reactions to both the depth and the lack of air. Only then did I check the dive watch. It read 41.0 – forty one metres. With our super special coach, Lisa. If anyone reading this is interested in freediving, Apnea Total Utila is a world class place to learn the art. Helena and I have to say a huge thank you to Tex, Marie and their instructors Lisa and Jon; their experience and professionalism is exceptional. Thanks too to Zach and Louis, the masters students, who are both incredible divers. One last thing, I have purposely written repeatedly about safety procedures in this account. It maybe detracts from the writing slightly, but it is of utmost importance that everyone understand two things: 1 – Helena and I have been diving with some very experienced divers whose number one priority is always the safety of everyone in the water and 2 – this priority on safety begins in the class room. You cannot and must not attempt to free dive alone, nor should you attempt static breath holds without qualified supervision. We would hate to think that we put anyone in danger by writing an account such as this. 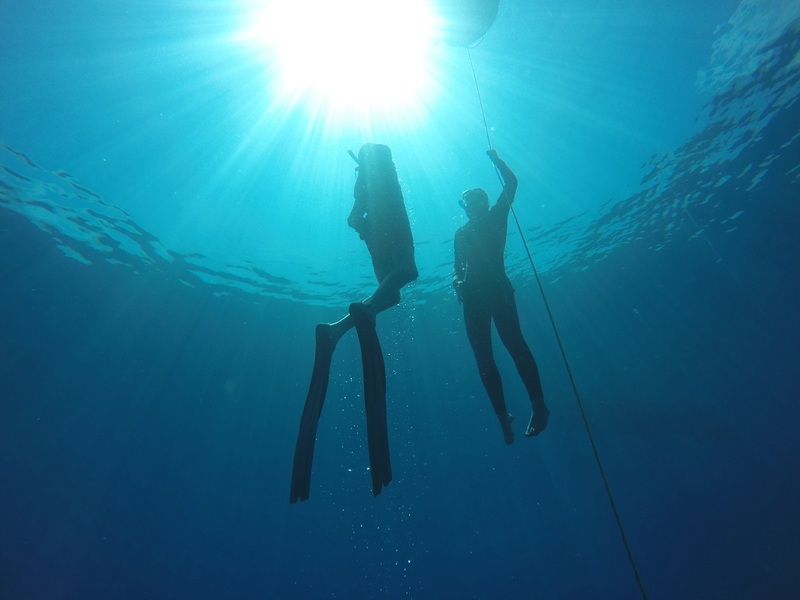 Get yourself to a freediving school – you’ll love it! Next postGuatemala: boats, buses and a black door. This was a fascinating window into an activity I didn’t know existed outside small fishing villages. Thanks for another great travelog entry. Holding my breathe for anything longer than a minute seems impossible. Reading about your triumph, and capability to not only hold your breath for over four minutes but dive to the ocean floor at the same time – it’s nothing short of remarkable. Obviously, you had a great coach and lots of support from Hels. I wonder how one makes the decision to commit their life to free diving? I’ve met child divers in the Philippines and South Korea who do this to harvest exotic seafood from the ocean floor, but never actually met anyone who did this as a sport or recreational activity. It’s a bit out of sync in terms of the timeline of the blog but our freediving adventure stands apart from our travel in many ways. Plus, I was desperate to write it! It has been an incredible experience so far and we have been lucky to have had the most incredible instructors. It’s interesting that you mention the Philippines – that’s where we first learnt to dive (check out our other freediving blog post from May if you like). Wolfgang, our instructor there, was doing a lot of work with the indiginous diving community, learning about their techniques and skills. They dive, as you said, mainly for food – to survive. Even so, he found divers capable of hitting over 80 metres with no specialist equipment. 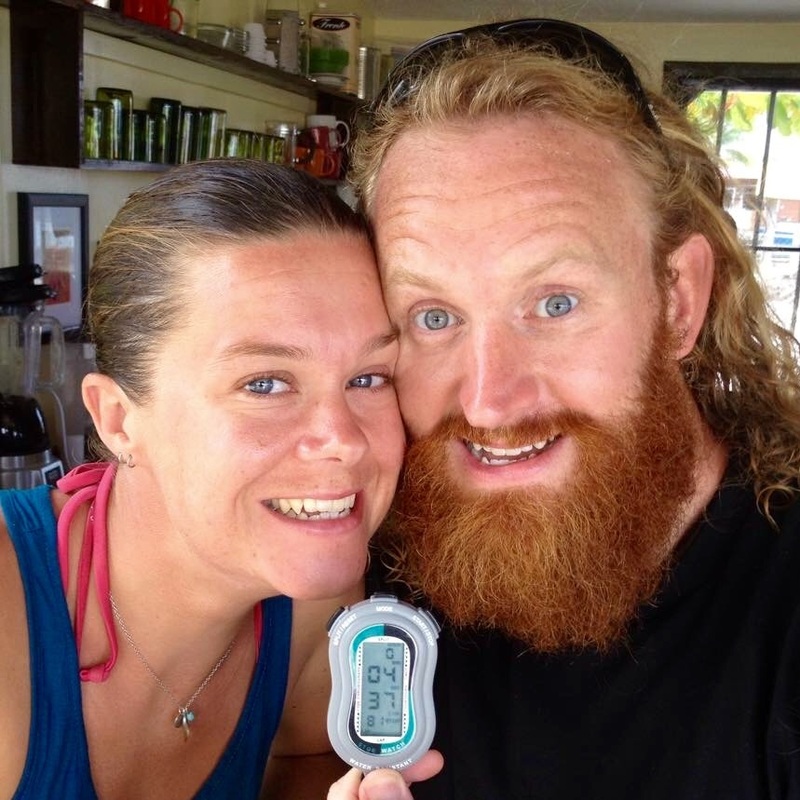 As for us – borne out of frustration at being refused a chance to scuba dive (due to my being asthmatic), we found it and were soon delving into a niche world of breath holding where dives to at least the depth I have reached so far are the norm! Truly wonderful blog – it is hard to choose a favourite as they have all been so good! especially the wine one but this tops it all. Thank you so much Chris and Helena. Now I must go and – BREATHE!